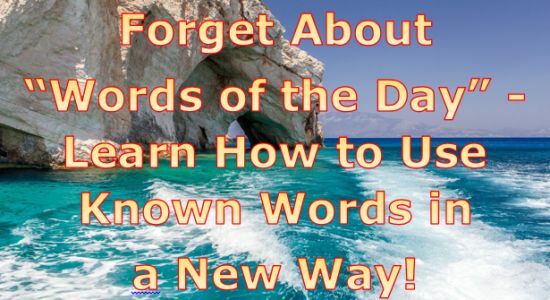 Forget About “Words of the Day” – Learn How to Use Known Words in a New Way! I’m sure you’re familiar with the concept of the “word of the day”, right? Every dictionary website on the Net has such words featured as a way of encouraging English learners worldwide to acquire new English vocabulary. Well, on the surface it looks like a great idea, and you may be under the impression that the more English vocabulary you know, the more fluent you’re going to be, so you’re singing up for such words being delivered to your inbox every day and you’re feeling like you’re really contributing to your English skills. In reality veteran English learners like myself will tell you right off the bat that learning new vocabulary words alone isn’t going to cut it. You’ll be just stuffing your brain full of some obscure English words with little to no opportunity of using them! There’s only one thing I can say – WTF?!? When, tell me when are you going to use such words? WHEN?!? Such vocabulary building serves no practical purpose whatsoever – unless, of course, you’re doing it so that you can annoy everyone around you by saying things nobody has a clue about! “Words of the Day” Are a Total Waste of Your Time and Effort! The exercise of memorizing obscure, sophisticated English words taken out of context is pointless! You may know what “grandiloquence” means (by the way – I didn’t even bother looking up its meaning, why would I? ), but at the same time you probably never learned that you can say “You’re dead right!” which uses a very simple English word DEAD in a completely different way! Maybe you just learned the meaning of the word “chatoyancy” (my MS Word spell-checker doesn’t even recognize this word!) – but what good is it if you can’t describe someone’s refusal as a “flat out refusal” which has the word FLAT used in a way you’d maybe never seen before? Or it could happen so that you memorized the word “effulgent” a couple of days ago, but believe me – you’d be much better off learning that you can respond to somebody’s statement by saying “Sound!” which is another way of using a well-known word SOUND. Well, there’s always the chance that you’re a true English super-learner and you’ve been managing both – memorizing “words of the day” as well as various ways of using more common English words. Your Lifetime Isn’t Enough to Learn Every Way of Using Those English Words You ALREADY KNOW! I’m personally still having moments of utter shock when hearing a native English speaker use a particular English word the way I’d never imagined it could be used and it just goes to show you, my friends, that you NEVER really stop exploring new ways of using your existing English vocabulary! I mean – at this stage I’ve been living in an English speaking country for almost 14 years, English has been my hobby for the best part of my life, but still I learn new ways of using known English words almost on a daily basis. Up until today, for instance, I would have used the English word STROKE only when referring to the terrible medical condition when a blood hemorrhage in brain results in brain cell death and subsequent loss of eyesight, feel and movement. But it turns out that the word STROKE is also synonymous with words such as “blow” and “hit”, and there’s also a number of English idiomatic expressions containing this word that have nothing to do with the brain condition: “stroke of luck”, “in one stroke” and others. Well, come to think of it, I actually knew one such phrase – “different strokes for different folks” – but the fact of the matter is that the word STROKE in this context has nothing to do with blows or impacts, so this meaning of the word STROKE is something completely new to me. Now, I hope I made it obvious to you, guys, that if you focus on acquiring some random “words of the day”, you’re missing out on countless opportunities to do what really matters for your fluency because when people speak in real life they mostly use phrasal verbs, expressions and sayings that are mostly made up from simple, well-known English words. You’re missing out on solidifying and cementing the vocabulary that you already know by learning how to use it in different ways, and if your lifetime isn’t going to be enough to do it, then why kill your precious time by stuffing some random, useless English words “of the day” into your brain? Nice to read this. Can’t agree more with your view. Basically, it is common sense, and such a heads-up on the right way to learn English for non-native speakers. I’m glad you’ll be able to put this article to good use – and it’d be great if you could keep us updated on whether your friend changes his mind or not! Few days ago,one of my friends sent me a link to download an app containing New words to increase vocabulary. I opened the app and found words which are never used in real life. I suggested him to read kids stories and romantic novels instead to build vocabulary. He was half convinced but now I am going to share this blog post with him and I’m sure he will be fully convinced this time about the importance of ignoring big peculiar soundining words and focus on simple words and phrases which are very much usable in real life.